I realized I was in for a fight, right about the time the bright orange stuffed animal flew past my head and collided with the inside of the passenger-side windshield. “I know you need to eat, but you’ll have to put your seat-belt back on before I drive you anywhere,” I calmly explained to my irate four-year-old. “I WANT TO EAT IN OLIVE GARDEN!! !” She screamed at me. The hysterical crying started to wane and she sat herself down on the floor in front of her booster seat. In silent protest to my parenting, she crossed her arms and hid down beneath the seat in front of her. We were in a stand-off. It all started in church a few hours before. Wriggling with frustration, Little Sprout and I made one exit to get her calmed down, but it was a struggle for her to contain the welling emotions. I knew they were coming, I just wished she hadn’t needed to blow her cork that day. 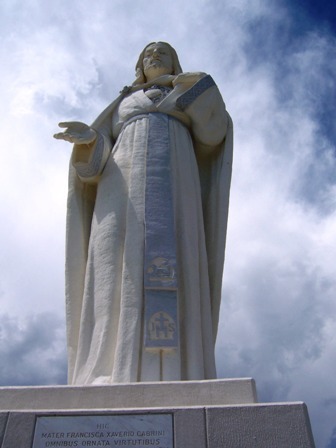 We had gone with my mom and my grandma to the Mother Cabrini Shrine, just west of Denver. It was a trip my grandmother had been hoping to take to celebrate the 60th anniversary of her engagement. Perfect time for Little Sprout’s emotional release! We made it through mass. With some of her pent up energy, she sprinted up the 375 steps to the statue of Jesus. I am sure she reflectively pondered the stations of the cross and prayed appropriately at the places for meditation. I just didn’t see her because she was miles ahead of me. 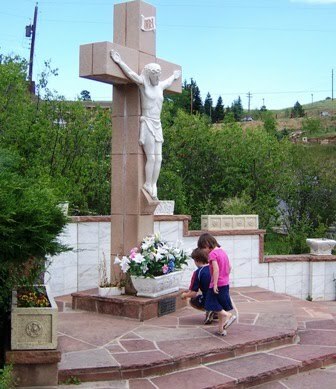 We slowed to a jog on the way down, and I did catch her following her brother’s lead to kneel at one of the crosses. They all dipped their hands in the natural spring, and you would think with all the peace and tranquility, at least some of it would rub off on Little Sprout. By the time we got back to the gift shop, she had lost her ability to maintain composure. The volcanic activity commenced. Our sweet, precious Little Sprout has incredibly physical tantrums. She was like a bull in a china shop as she gave way to the Tasmanian Devil tendencies. Nothing seems quite as inappropriate as watching a path of destruction in the Mother Cabrini Shrine gift shop. She started her second time-out on the bench just outside the shop and then came screaming and running into the store. I explained to my grandmother that she was going to be going in to lunch with my older two and my mom, but that Little Sprout and I were going to have to stay in the car. Trying to communicate that calmly, over the continuous screaming out of the back, was tricky. Little Sprout had calmed a bit by the time we arrived at the restaurant, but the consequence had been set. As everyone else climbed out to go in to the restaurant, I told her she was going with me to get something else to eat and we would be eating in the car. She took off her seat-belt, made a beeline for the door, and I caught her by her arm just as my mom was able to get the door closed. So there we were, in our stand-off in the Olive Garden parking lot. My mom brought out my salad and breadsticks while I waited…twenty-five minutes…before Little Sprout finally climbed back into her booster and clicked her belt. What I learned about Little Sprout that day: She needs lots of sleep! She misses her dad. She is angry she isn’t able to see him as much as she had expected before we came. She holds in emotion well, but eventually can no longer contain those ugly feelings. She has patience and stamina (something I am sure will challenge me through the years) and, she’s got a good arm (she threw that stuffed animal from the third row in my car). Thank goodness she cannot aim all that well yet. I stayed up too late last night reading some of your wonderful blogs. What a fun way to keep up with one of my favorite families! 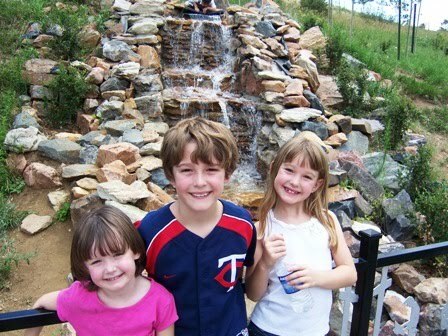 From this blog I saw a clone of our Allison, now 13, when she was little. Jenn used to call the time before dinner the “witching hour” because Allison would have the same behavior my sweet little Delight #3 had in this post. Once when Al was with us for a Spoiling Week, I tried an experiment. Before witching hour started, I gave her a couple crackers and some carrot sticks, and lo and behold, no witching hour. I’m guessing Allison had some low blood sugar issues when she got too hungry and they just spiraled her out of control. I also had a big giggle remembering one time when you were at a soccer meeting and the three delights were with me. I can still see Delight #2 standing on the kitchen side of the fireplace, with a hairbrush or some such thing as a microphone in her hand, her brother and sister on the living room side of the fireplace waiting their turns. In her very best professional news anchor voice, she announced, “And now we will talk about…..bottoms!” Did I ever tell you that? I nearly fell of my chair laughing. Good times. That is really funny, and I can TOTALLY picture Middle Sprout doing that! You are a wise woman, and I think the small snack before the witching hour would curb so many battles. I am going to use that!! Hugs back to you guys! Hopefully we can see you soon!